One of the most significant challenges persons with disabilities face is the simple inability to leave their own home. We partner with consumers and their community to build ramps and do home modifications. We have information on ADA ramp guidelines and suggested materials that we can give to you to make the process easier. If you or someone you know is in need of a home modification, please contact Kathy Baker at 706-314-0008 or at kbaker@nwgacil.org. This program to provides refurbished assistive technology (AT) such as computers and CCTVs and refurbished/sanitized durable medical equipment (DME) such as walkers, shower chairs and wheelchairs. For many persons with disabilities, AT/DME can make a significant contribution to an independent life. Please contact us at 706-314-0008 or info@nwgacil.org if you are interested in participating in this program (whether through donating equipment or receiving equipment). NWGA Center for Independent Living (NWGA CIL) and Floyd County Emergency Management are pleased to announce that we are partnering together to help citizens of Floyd County who are deaf or hearing impaired to be alerted to inclement weather. 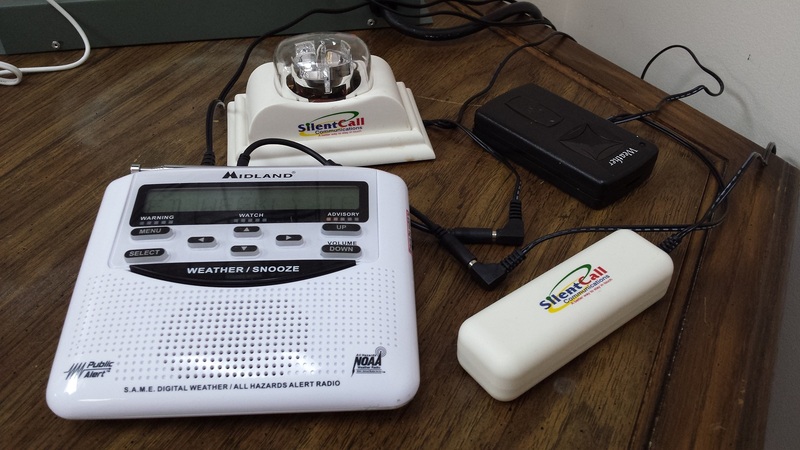 We are distributing weather alert radios with strobe lights and vibrating alarms. Any deaf or hearing impaired resident of Floyd County can sign up as an NWGA CIL consumer. We will then issue one of these life-saving alert radios free of charge from our office at 242 North 5th Avenue, Rome, 30165. Please contact us at 706-314-0008 or at info@nwgacil.org to arrange an appointment for this program.